Coursera is an online education company that partners with 160 of the world’s top universities and industry leaders to offer courses, Specializations, and degrees that empower learners around the world to achieve their career, educational, and personal enrichment goals throughout their lives. Since launching in 2012, the company has grown to 31 million registered learners who can choose among 2,600 courses and 236 Specializations. Leading universities are now also working with Coursera to offer online degrees in areas like business, computer science, data science, and public health. Coursera is backed by leading venture capital firms such as Kleiner Perkins Caufield & Byers, New Enterprise Associates, GSV Capital, International Finance Corporation, Laureate Education Inc., and Learn Capital. For more news, highlights, and stories from Coursera and our community, visit the Coursera blog. Coursera invests in research and surveys to better understand online learners, their goals and motivations, and the impact of learning on their lives. See below for our recent data reports. Since releasing the first Learner Outcomes Survey in 2015, we more than doubled the size of our learner community globally. 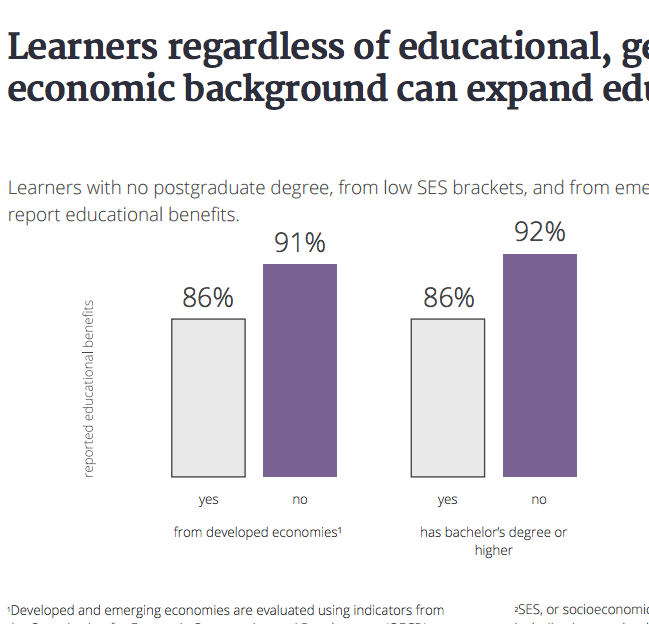 This report takes a deep dive into the increasing career, educational, and personal benefits that impact learners as Coursera continues to grow. We commissioned research into the challenges that today’s young professionals face, with a focus on adults aged 22-35 in the United Kingdom. Our results shed light on how concern over career growth and a lack of learning opportunities may impact the life goals of a whole generation. At Coursera, we’re always working to better understand our millions of learners around the globe. This infographic reveals data around where, when, how, and why people are learning online. Online learners are reporting real, tangible career and educational results. This report is based on research conducted by Coursera, University of Pennsylvania, and University of Washington for a paper analyzing the results of a survey of 52,000 Coursera learners that was published in Harvard Business Review.